Island Way Fruit Shell Sorbet is delicious and super fun to eat! To be honest, the Island Way fruit shell sorbet isn’t the healthiest thing out there! See nutrition facts below). However, it’s definitely very fun to hold your sorbet in real fruit shells. How is the Island Way Fruit Shell Sorbet Made? The company halves the fruit, empties out the juice and meat, and freeze dries the shell. Yummy sorbet is then filled in before the whole product is frozen and individually wrapped. I can tell you that this is a very fun sorbet to enjoy. I have entertained many guests with this. They are always wowed by how the sorbet is held in real fruit shells. The sorbet is delicious! It reminds me of being in the tropics. Sitting on a beach enjoying a fruity dessert. It is truly the taste of never-ending summer! I think the Island Way fruit shell sorbet is a great snack to entertain guests and kids alike. Shopping for Sorbet and Ice Cream Makers? Ordering sorbet or ice cream online can be costly and inconvenient. Why not make your own? Back to the good stuff! 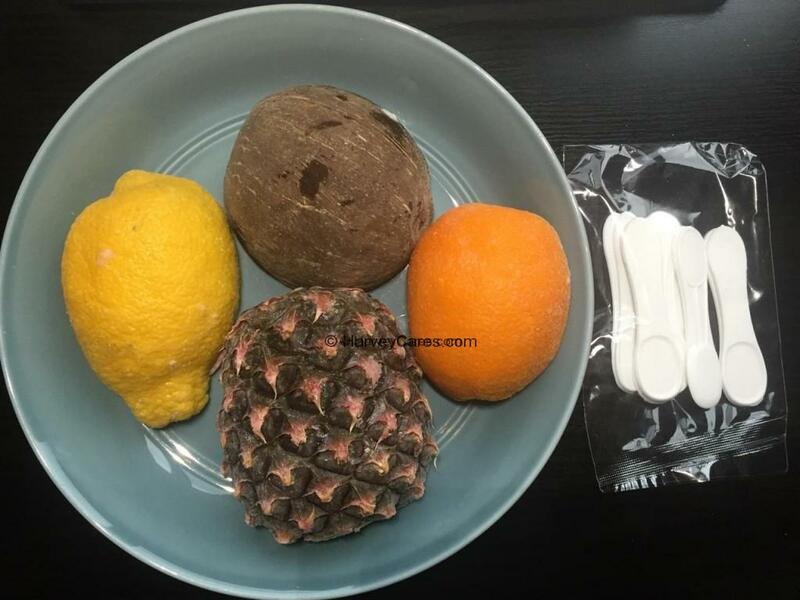 Take a look at a detailed product review of the Island Way fruit shell sorbet below. Coconut flavor (in real coconut shell): Water. Cream (from cow’s milk). Sugar. Skim milk powder. Coconut cream powder. Artificial flavors. Stabilizer (Mono & Diglycerides of plant origin, Guar gum, Carrageenan). Salt. Pineapple flavor (in real mini pineapple shell): Water. Pineapple juice concentrate. Sugar. Glucose corn powder. Cream (from cow’s milk). Artificial flavors. Stabilizer (Mono & diglycerides of plant origin, Locust bean gum, Guar gum). Passionfruit mango flavors (in real orange shell): Water. Orange juice concentrate. Sugar. Liquid sugar. Glucose corn powder. Cream (from cow’s milk). Stabilizer (Mono & Diglycerides of plant origin, locust bean gum, guar gum). Natural flavors. Pomegranate and lemon flavors (in real lemon shell): Water. Sugar. Liquid sugar. Cream (from cow’s milk). Lemon juice concentrate. Glucose corn powder. Stabilizer (Mono & diglycerides of plant origin, locust bean gum, guar gum). Natural flavors. 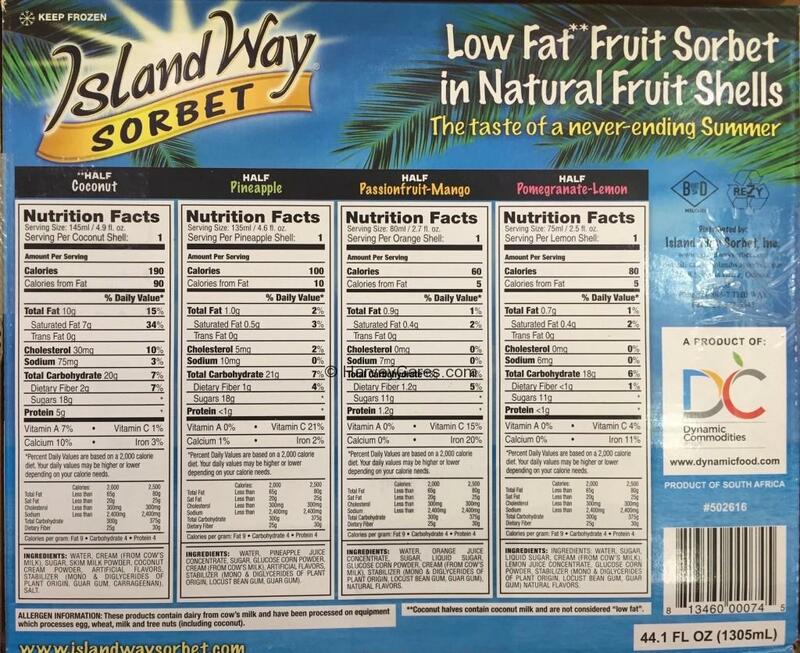 Allergen information: Island Way fruit shell sorbet product contains dairy from cow’s milk. The product is also processed on equipment that have processed egg, wheat, milk, and tree nuts (including coconut). The Island Way Fruit Shell Sorbet serving size is 1 fruit shell sorbet. There are about 12 servings per container. 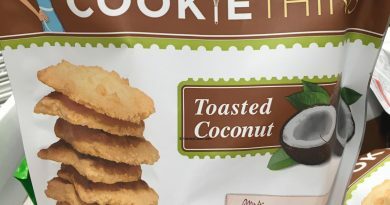 60 to 190 calories per serving (coconut flavor is the highest). 5 to 90 calories from fat per serving (coconut flavor has the highest fat per serving). This is a 44.1 fl oz (1305 mL) container. You can get a better idea of what the real fruit shells look like below. 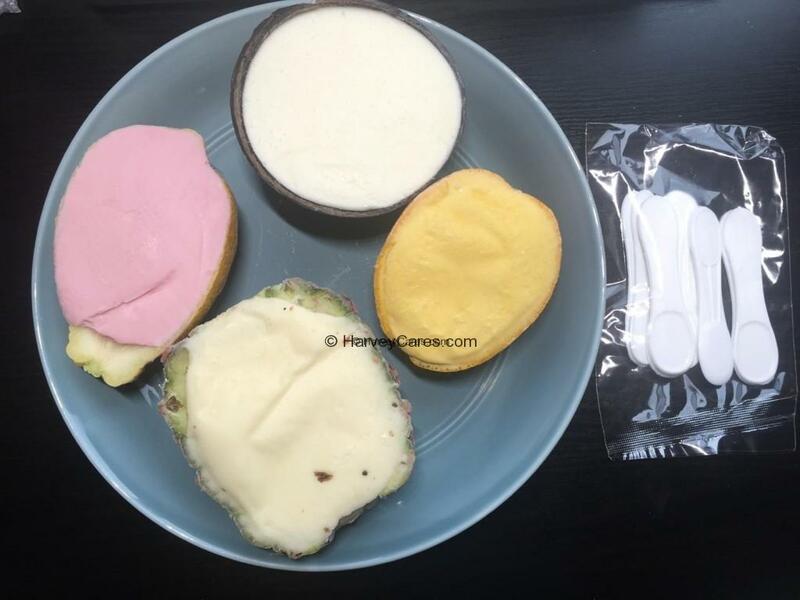 The picture below shows the back view of all 4 flavors. 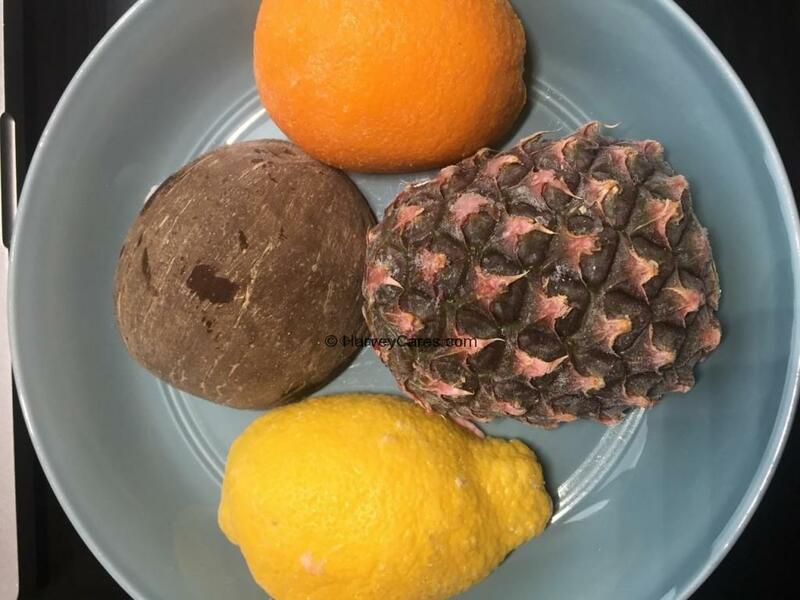 You can see the real fruit shells that hold the delicious sorbet. Each fruit shell is individually wrapped. 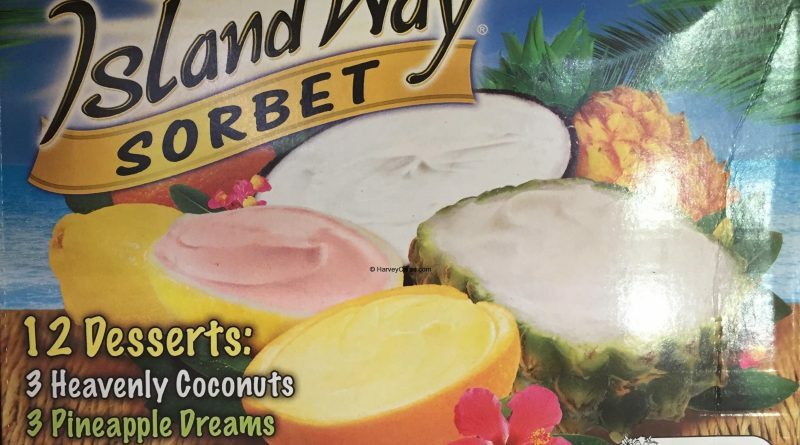 Island Way fruit shell sorbet is very fun to eat and share with friends, family, and guests. Give it a try next time you see it at Costco or your local supermarket. The Island Way fruit shell sorbet actual unwrapped view. Island Way fruit shell sorbet actual view unwrapped (back view of all 4 flavors). The real fruit halves are the perfect snack size. Fits nicely in your hand. Island Way fruit shell sorbet actual unwrapped view of the fruit shells (front view of all 4 flavors). Here you can see what the sorbet filling looks like in the fruit shells. 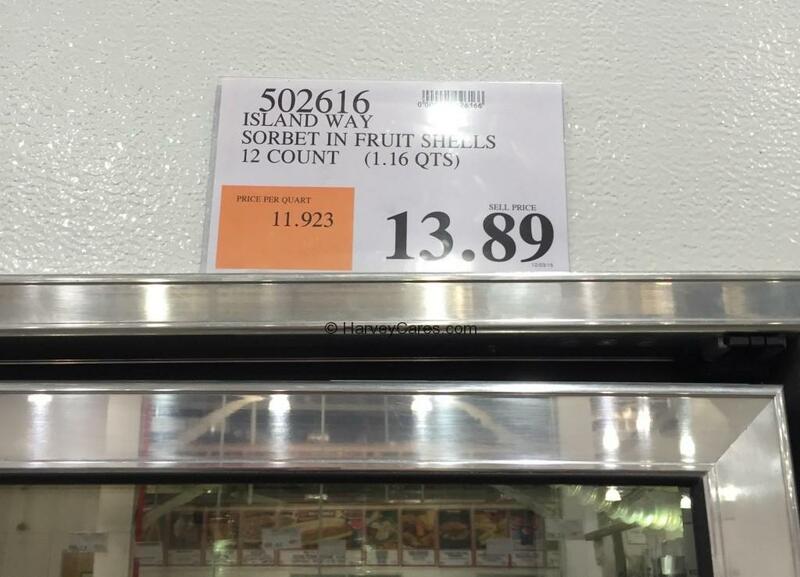 Looking to Buy Island Way Fruit Shell Sorbet Now? 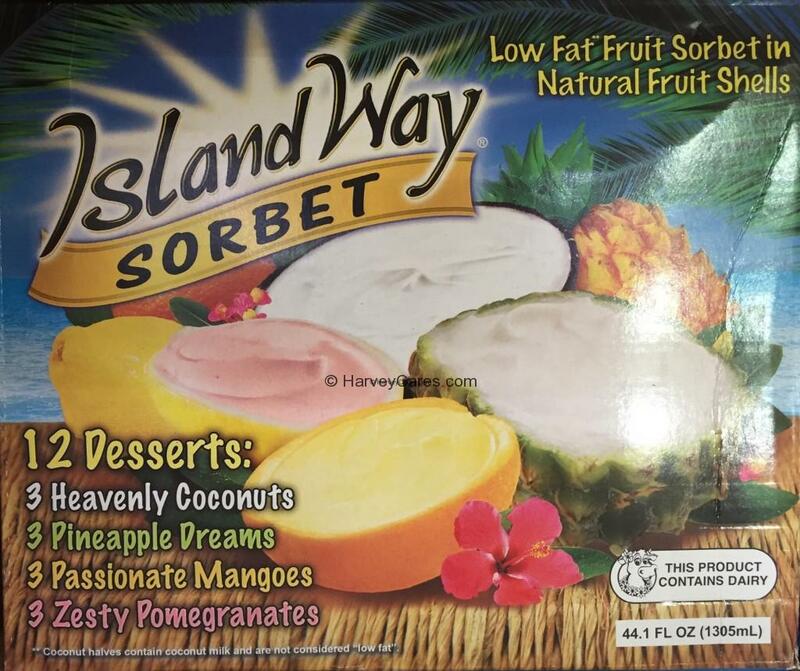 Unfortunately, since the Island Way fruit shell sorbet is a frozen product, it is difficult to find the item online. Shipping charges will be high too. Why not make your own ice cream and sorbet? See the most popular and highly ranked products at the top of this article. Have you bought the Island Way Fruit Shell Sorbet before?